About 100 years ago, an old woman sat by a dim light stitching white silk and lace by the feel of the fabric, her eyes having failed her. The gown she sewed was to be worn by a new baby boy. While rejoicing in the arrival of her grandson, she may have felt some remorse while moving needle over fabric. The gown he should have worn had been buried with his sister before she made it to her first birthday. I wonder if the fabric felt stiff and tight in her worn hands. I wonder if her eyes, though nearly blind, gave her just enough sight to see her grandson in it. I wonder if she cuddled that babe in the gown her hands made, putting aside the sadness of a lost child and rejoicing in the arrival of this new member of the family. I wonder if she even had a glimmer of an idea that nearly a century later, another little boy would slip his arms into the now delicate fabric to share in the ritual of baptism connecting him to a community, a family and a lineage that reaches back to the hands who made that gown. My grandmother’s grandmother made the gown my two sons, myself, my sister, my mother, my uncle, my grandmother and great-uncle wore for our baptisms. 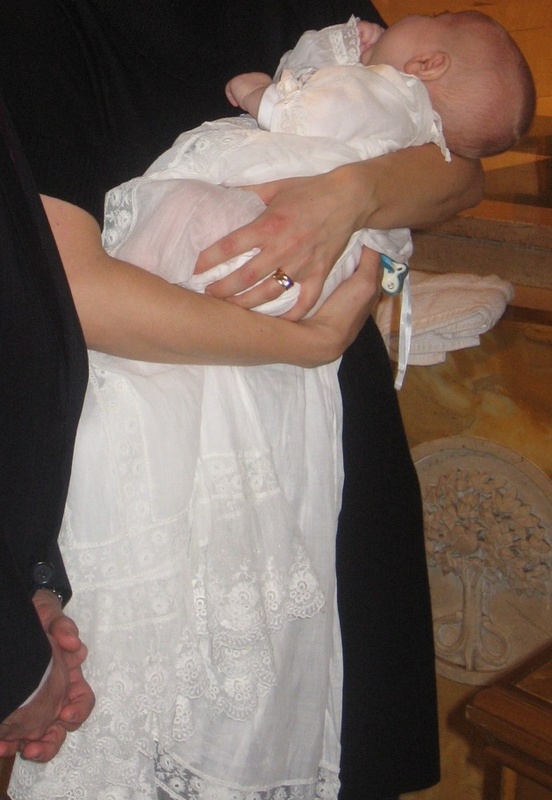 As I cradled my little man this weekend, I was overwhelmed by the connection this gown gave me to the mothers in my family. My great-grandmother, grandmother and mother all held their precious babies before God, wrapped in this beautiful gown, to say thank you for this most wonderful blessing and pledge their best in raising their children. Did they all feel the same wonder, innocence, hope and love that I did? Did they all marvel at the overwhelming responsibility? Did they all feel the same unbound joy? This gown that has survived the generations, that has clothed the newest buds on our family tree holds the past, present and future in its delicate folds. Just as each of the mothers held the past, present and future in the babies that wore it. I can only hope to one day hold the children of my children in this same gown, passing along the lace, its history and the hope for the future stitched into it by the hands of my great-great grandmother. That breeze you felt in early January was the collective parenting community breathing a sigh of relief after surviving the holiday onslaught of family, decorating, travel, baking, shopping, Santa-visiting, wrapping, unwrapping, eating, cheers-ing, and undecorating. I, for one, was excited (perhaps too much so) to send Peanut back into the weekly schedule of preschool after the holidays. The promise of a routine for this new two-kid family had me nearly salivating. Unfortunately, what I’ve learned as a parent of two kids is that there is no such thing as routine anymore. I’m desperate to have a “normal” week in order to figure out what schedule Pumpkin wants to be on. With Peanut, I was happy to let him dictate his daily rhythms. With Pumpkin, poor kid is lucky if gets to nap in his crib and not in his car seat or stroller while we’re on the go, go, go. And with the demand of preparing for Pumpkin’s baptism this weekend and the 11 family members traveling down to share in that moment, there has been no such thing as a “normal” week for us. Instead, I feel like I’m on a treadmill – constantly running from one activity to another without accomplishing anything. If only this treadmill toned my glutes it might feel more satisfying. So, apparently I breathed my sigh of relief in early January too early. Now, I’ll wait for this weekend to pass and perhaps hop off this treadmill long enough to enjoy our family and Pumpkin’s celebration. Then, I’ll foolishly believe that we’ll start in on a routine next week. Mama needs a shower, but infant is screaming his proverbial head off for no easily defined reason. You bounce, rock, soothe, snuggle, sing to and otherwise try to calm your cranky child. Eventually, he falls asleep in your arms. You live in fear of waking the baby, so contort yourself into the least uncomfortable position in the rocker and hope the Newsweek nearby holds enough articles or Bravo! runs enough episodes of The Real Housewives to get you through however a long a nap this is going to be. He will inevitably wake up a few hours later hungry. You’ll manage to feed him, change him and try to pee while trying to regain the feeling in your arms. At some point, you’ll realize it’s 3pm and you haven’t eaten lunch and are still in your jammies. You will now give up hope of showering or getting dressed until the hubby’s home from work and you can hand off the baby to his fresher arms. You plop that screaming similarly inconsolable child in the bouncy seat in the bathroom, turn on the bounce, turn on the bathroom fan, turn on the shower, pop in the pacifier and he’s fast asleep before the water’s even heated up. Ah, the joys of experience and clean hair. I have a confession to make. I am in love with another man. Don’t worry, the hubby already knows. We both reread the book before pumpkin arrived to refresh ourselves on the 5 S’s. For those of you new to Karp’s theories, it’s boiled down into the idea that the first three months of baby’s life are essentially the missing fourth trimester of their development. During this fourth trimester, the easiest way to calm a baby is to mimic the womb environment it just spent their entire existence in. Makes sense that the big, bright world might be a bit overwhelming considering the confines of a woman’s uterus. 1 – Swaddling. With both my babies, the more they fought the swaddle, the more I knew it was going to work. And sure enough, once wrapped tight into that cute little burrito, they would relax into the boundaries we had created, their arms finally stilled. In fact, the swaddle worked so well on Peanut, we kept doing it so long we nearly ran into trouble weaning him from it later. 3 – “Shhhhhh” – the power of white noise. A nice, loud “SH” in Peanut’s ear always worked. The “shh” and sound machine have definitely been Pumpkin’s friends, too. It’s worked so well that Peanut will actually try the “shh” on Pumpkin, which is totally adorable. 4 – Swinging. This “S” is all about the motion. Peanut L-O-V-E-D the swing. Some days it was the only way I could get him to nap during the day at all. Pumpkin’s more of a jiggler, but a jiggle and a sway? Oh yeah. That’s this kid’s sweet spot. 5 – Sucking. Peanut was never into the pacifier. Pumpkin’s a total believer. It works almost too well and I fear the hubby and I will grow dependant on it. We’re going to try weaning him from it around three months since he’s already finding his hand every once and awhile and seems to prefer it to the paci when he does. But I have a secret. I have found the sixth S.
One night, when peanut was particularly fussy, I was singing whatever I could think of as I rocked, swayed and shh’d my swaddled baby. Nothing was working. Finally, I got to the itsy-bitsy spider in my repertoire and quiet. I wasn’t sure if it was the song or if I’d simply outlasted peanut. I tried it again and again in various situations and it ALWAYS worked. No clue why, but, hey, go with what works. With Pumpkin, there was a day when the fussies were just not being appeased by the other standbys so I dusted off the old itsy-bitsy and sure enough, it worked like a charm. Since then, it’s worked repeatedly on those days when I can’t figure out what’s wrong and he seems to need just a little extra TLC. I was trying to explain New Year’s resolutions to peanut yesterday at which point he announced he’d be playing more trains in 2010. Way to set yourself up for success, kid. It got me thinking, though, about those dreaded resolutions and how many of us tend to set ourselves up for failure. Whether it’s the gym, weight loss, kicking a bad habit or, in my case, writing every day, there’s a reason most of us have broken our resolutions by Valentine’s Day. Peanut might be onto something when he resolved to do something he could easily accomplish. After neglecting this space for nearly a month, neglecting my writing for more than 10 months and overall neglecting my mental self, I knew any resolution to blog more, write more, be more would surely be broken by the demands of my kids, trips to Target and life’s more mundane obligations. So I’m trying a different tactic this year. I resolve, in 2010, to be more selfish. Whether that means I write, I exercise, I schedule that massage or simply take a bath, I resolve to take time for me. I know it’s vague and could be easily lost, but my biggest problem is standing up for myself when it comes to my own time. I, like many moms, often put my own wants and desires on the back burner in order to accommodate the other members of this family. This resolution will certainly not put a halt to that, nor would I want it to – caring for this family is my job right now and I aim to do it as best I can – but it allows me the opportunity to visibly show my family that I need to focus on the me that isn’t mom for a little bit. By resolving to address the root of the problem, the writing and the loss of the baby weight and that massage will come a little more easily. If anything, it gives me a voice that I can take ownership of. “Me time” is something, like “date night,” I never thought I’d have to schedule into my life, but if that’s what I have to do, I’ll do it. Luckily, the hubby already tries to give me time to myself, but readily agreed to the selfish plan for this year (a sign that maybe he sees a bit of my mental sanity cracking under the pressure of the two kid adjustment?). So 2010 is the year where I dust off those metaphorical high heels a bit more often and remember how good it feels to be in them. And if in the course of trying a few old pairs back on I realize they don’t fit anymore, I’ll happily use that selfish time to find a few new pairs. Happy 2010! May it be filled with joy, peace, comfort and whatever version of high heels you need in your life.